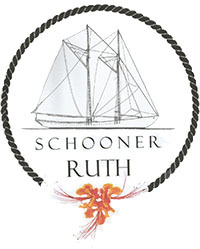 The Sail Training Program has been designed by Schooner Ruth to celebrate the ties of Barbados and the Windward Islands, New England and the Canadian Maritimes while expanding knowledge of the Caribbean through the use of traditional & modern seamanship and sail training techniques. With a strong seamanship and traditional sail training program developed by the IMO-STCW2010 and RYA training platforms and with alumni of the Canadian Great Lakes Brigatines Playfair, Pathfinder & St. Lawrence II (one of the longest running sail training programs in the world ) onboard Schooner Ruth trainees can feel that the knowledge gained will be of the highest standard of both modern & traditional seamanship. Trainees will be considered an active part of the crew. While on watch, trainees will set & take in sail, help the cook in the galley, climb aloft to furl the topsails, take their part in the traditional rigging maintenance onboard, steer the ship by night and by day, and yes – scrub the deck. Trainees on longer voyages will also be exposed to traditional means of navigation. Learning the history of & how to use a sextant, taking a ships log, plotting a position on a chart & coastal pilotage will be introduced. By using Sail Training as a medium, trainees will be able to apply their knowledge of physics, biology, history, geography and social & political sciences in a tangible and encouraging environment. Upon clearly displaying a thorough understanding of the concepts & skills taught while on board Schooner Ruth, each trainee will receive recognition in a logbook accredited by the Master of SV Ruth which they may present to future vessels as proof of their training. Amidst the seriousness of traditional Sail Training is something else – an opportunity like no other to explore. An opportunity to experience new worlds with new people, discover the freedom of moving a 100’ vessel with only wind, and to explore just how far one can push one’s self.